You are here: Home / More Featured Posts / Adam Lambert Honors George Michael in Song and Fashion! 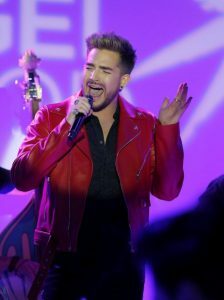 Adam Lambert wowed the crowd on Saturday when he performed a three-song tribute to George Michael at the Project Angel Food Gala. Adam truly honored George with his choice of fashion. 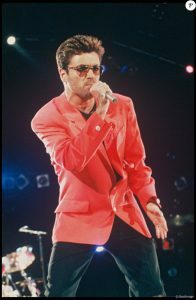 When George sang at the Freddie Mercury Tribute Concert, he also wore all black with a red blazer. Getting back onto the stage two weeks after closing the Queen + Adam Lambert Tour, Adam reprised Faith, which he sang on August 2016’s Greatest Hits Finale. He also gave a stunning One More Try and brought a full circle closure when he ended with Somebody To Love, which George sang for the 1992 Freddie Mercury Tribute Concert. Adam even noted this during his performance. Project Angel Food is a charity organization that delivers 10,000 healthy meals a week to people battling critical illness. It was George Michael’s philanthropy, donating over $500,000 to it since 1993. He made an annual $25,000 donation, plus volunteered time behind the counter. For this, he posthumously received the Elizabeth Taylor Humanitarian Award. Read more about the event here from Lyndsey Parker. OMG, I want a red leather motorcycle jacket now!